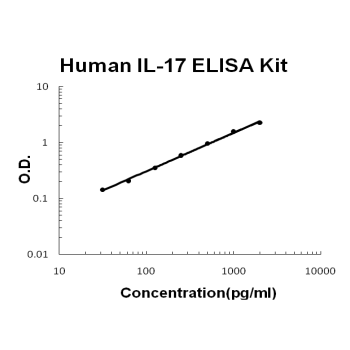 Sandwich High Sensitivity ELISA kit for Quantitative Detection of Human IL-17. 96wells/kit, with removable strips. Restricted to activated memory T-cells. Induces stromal cells to produce proinflammatory and hematopoietic cytokines. Enhances the surface expression of ICAM1/intracellular adhesion molecule 1 in fibroblasts. Cytokines, Immunology, Innate Immunity, Interleukins, Macrophage / Inflamm. IL-17 is an inflammatory cytokine produced primarily by a unique lineage of CD4 T cells that plays critical roles in the pathogenesis of multiple autoimmune diseases. Interleukin-17 is expressed by activated T cells and is 57% identical to the 17- to 26-kD secretory glycoprotein encoded by gene 13 of the herpesvirus saimiri(HVS-13). IL17 induces nuclear factor kappa-B and the expression of IL6, intercellular adhesion molecule-1, granulocyte macrophage colony-stimulating factor,and prostaglandin E2, as well as the maturation of CD34 positive hematopoietic precursors into neutrophils. Anti-IL17 antibodies significantly inhibited osteoclast formation induced by culture media of RA synovial tissues. The standard product used in this kit is recombinant human IL-17, consisting of 136 amino acids with the molecular mass of 16KDa. Li Xn, Pan X, Qiu D. Int J Clin Exp Med. 2014 Dec 15;7(12):5324-9. Ecollection 2014. Imbalances Of Th17 And Treg Cells And Their Respective Cytokines In Copd Patients By Disease Stage. Jiang K, Chen Hb, Wang Y, Lin Jh, Hu Y, Fang Yr. Zhongguo Dang Dai Er Ke Za Zhi. 2013 Aug;15(8):604-8. [Changes In Il-17 And Tgf-? ?1 Levels In Serum And Bronchoalveolar Lavage Fluid And Their Clinical Significance Among Children With Asthma]. Lu R, Zeng X, Han Q, Lin M, Long L, Dan H, Zhou G, Chen Q. Mediators Inflamm. 2014;2014:701094. Doi: 10.1155/2014/701094. Epub 2014 Jul 8. Overexpression And Selectively Regulatory Roles Of Il-23/Il-17 Axis In The Lesions Of Oral Lichen Planus.